Derived from the words “puto” or steamed glutinous rice and “bumbong” or bamboo tube, puto bumbong is a well-loved Filipino delicacy particularly during Christmas season. Puto bumbong, which is commonly paired with hot chocolate or tea, is often bought by churchgoers after Simbang Gabi. In addition to being the most popular delicacy during Christmas season, puto bumbong remains to be a big hit all year round. 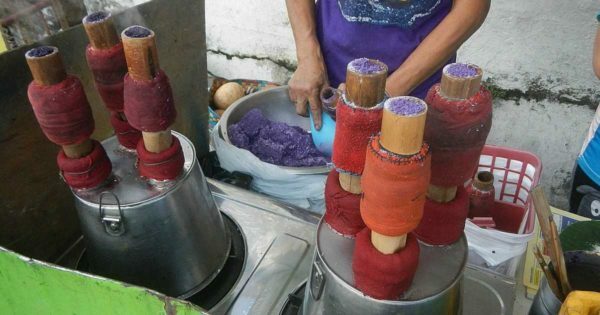 It is known for its violet color, which is brought about by the food color added to the glutinous rice. It is cooked in a special heat steamer mounted on a pot of boiling water, also known as lansungan. It only takes a few seconds for the puto bumbong to be cooked. This gives you the chance to produce a lot of puto bumbong in just a short amount of time. Many customers like their puto bumbong served hot so it is often prepared and cooked by order. It is served in banana leaves and often topped with shredded coconut, sugar and butter. Here’s a simple recipe for puto bumbong. Soak glutinous rice in water overnight. After soaking, grind the soaked rice. While the glutinous rice is being ground, add in the food color. Using a muslin cloth, wrap the glutinous rice then drain excess liquid by placing it in a strainer. You may also get rid of excess liquid by pressing a heavy object placed on top of the muslin cloth. When the ground rice becomes slightly dried, rub it against the screen of the strainer to come up with coarse grained rice flour. Fill each bamboo tube with rice flour and place it into the steamer. Make sure that the steamer contains boiling water. Steam rice flour in the bamboo tubes until steam comes out of the bamboo tubes. Remove immediately and push out the puto bumbong. Top with shredded coconut, butter and sugar.